The Art Made Me Do It! : "Last weak I cud not spel artis. Now I are one." A poor craftsman blames her inspiration. The dreary case of Maria Alquilar's ugly and illiterate ceramic mural for the Livermore Library illustrates just how ignorant and untalented many American "artists" actually are.Ms. Alquilar's creation had everything that government committees value in today's public art, i.e., a huge chunk of diversity worship that excludes only beauty and inspiration seeking only to mollify and soothe. It is and, except for a few mistakes, would have remained a forgettable eyesore, noted only by pre-schoolers on a dubious field trip. The mistakes? For starters it couldn't spell "Shakespeare." 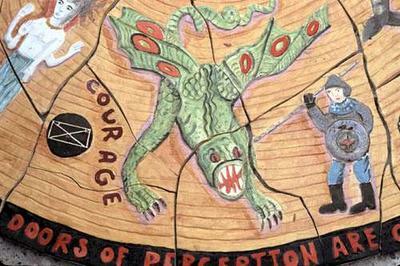 Ms. Alquilar 'created' a series of four dreadful but politically correct clay plaques that were, with some ceremony and a cost of $40,000, installed at the entrance of the new library in Livermore, California. Due to the joint failures of the primary, secondary, and collegiate educational systems in the United States, Ms. Alquilar managed to give "creative spellings" to such names as Einstein, Gauguin, Michelangelo, Shakespeare, and van Gogh. She also blew 'Kachinas' and 'Nefertiti,' along with a few others. The artist who misspelled the names of famous people in world history on a large ceramic mosaic outside Livermore's new library can spell one word with ease: N-O. That's Maria Alquilar's new position on fixing the typos. She had planned to fly to California and put the missing "n" back in Einstein and remove the extra "a" in Michelangelo, among other fixes. But after receiving a barrage of what she called "vile hate mail," Alquilar said Livermore is off her travel itinerary and there'll be no changes by her artistic hand. .... When asked whether she chose the words and names for the work or whether the city provided her with a list, Alquilar took an artistic stance in response. If you hear an echo of "The dog ate my homework." in that last remark you are not alone. "The art chose the words." Does that mean that the art is stupid but the artist is free of all responsibility? I imagine it does. The art is even more stupid on Ms. A's web site. Here we are treated to the required "artist's comments" on the "meaning" of her four circles of crudely formed and garishly colored baked mud. This would be an outstanding example of boneheaded pap if it stood grandly alone on the page. Alas, it does not. Above these "justifications" are photographs of the art in question. The primary quality of these slabs is a faux-primitive style Ms. Alquilar has cobbled together to disguise the fact that she can neither draw nor sculpt. In another era, one with minimal expectations of its artists, the absence of these two talents would have consigned Alquilar to the role of quaint craftsperson palming off crude figures on drunken tourists en route back to a cruise ship. In our besotted times, Alquilar's ingratiating ability to incorporate into her "art" numerous approved icons of oppression and suffering assures her of a more than adequate stipend. Hence she is able to inflict both an absence of talent and a numbing ignorance upon a long suffering public. This little kerfuffle will only increase her standing among those who put correct ideology above talent. She's an artist for all our Stalinesque seasons. Throughout her "ordeal" Alquilar keeps harping on a William Blake quotation to justify her ignorance -- "If the doors of perception were cleansed everything would appear to man as it is, infinite." It is unlikely that Alquilar has actually read Blake's "The Marriage of Heaven and Hell" from which the quote is taken. Like much of Blake, it is an opaque, obscure, and difficult work. I fear it is much more likely Alquilar ran across the phrase at a late night bong festival and it stuck. The quote has long been popular among stoners and acid heads since Jim Morrison uttered it in the late 1960s. Even then he probably pulled it from Aldous Huxley's monograph on take hallucinogenics rather than from the Blake text itself. Still, if Ms. A had looked into the original text she would have noted that the line after the one above that completes Blake's thought reads: "For man has closed himself up till he sees all things thro' narrow chinks of his cavern." Staying inside the 'narrow chinks of her cavern,' seems to be what Ms. A has planned for herself in the near future. In that she'll have the company of the vast majority of those among us who, like her, lack the talent but not the bravado to call themselves "artists." It is not entirely without irony that the figures that suffered most from Alquilar's historic and linguistic ignorance are, for the most part, those "dead, white, male" artists of long ago; artists whose talent was so gigantic that Ms. Aquilar's small gift, in comparison, lurks somewhere below the size of a quantum particle. 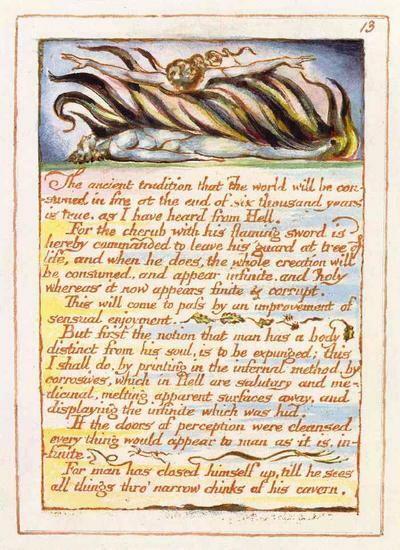 Here is the page by William Blake from which the "...doors of perception..."quotation is taken. Perhaps the fact that we live in a time and in a culture so rich that even the ignorant and untalented may proclaim themselves "artists" and be taken seriously is the reason that so much of our "art" (high and low) is utter garbage. A depressing notion. Even more so because it is probably true. These lines from Dante appear in countless online quotation banks, though Alquilar substitutes "knowledge and truth" for the customary "virtue and knowledge". In the original: fatti non foste a viver come bruti, ma per seguir virtute e canoscenza. By virtue, Dante meant manly virtue - John Ciardi translates virtute e canoscenza as "manhood and recognition". Dante did not intend this to be one of those little inspirational tidbits that people cut out and paste on things. The words are spoken by Ulysses in Hell (Inferno, Canto XXVI) as he describes how he exhorted his men before leading them to their doom. "Couldn't spell 'Shakespeare'" is a rather poor example, as, famously, neither could Shakespeare. So it is said, but we don't live in that space/time but in this one, Einestine. A contemprary of Van Den Puup, no doubt. [ See the Elite Designers against IKEA] I suspect, however, that www.elitedesigners.org is intended to be satire, while $40,000 art projects at public expense are not. Einestine? Oh, you mean Ahskar. Or was it Osker? Maybe Oscirr? Oh the heck with it - call him Mr. Pedant. ...and Taranto will be delighted that you worked "kerfuffle" in there. Ah, I'd forgotten about that. No, wait, I lied. I hadn't forgotten. In fact, it it wasn't for Taranto I wouldn't have had that wonderful word come to mind. Personally, I'm hoping to do for "philtrum" what Taranto has done for "kerfuffle," but I can't figure out how to work it in as often. Another interesting comparison is the original painting she was attempting to copy. We have yet to hear from the folks at Livermore who commissioned and paid for this work. Kind'a embarrassing I imagine. The Mercury News has a story today about a public art project that is going better than this one. Unfortunately the web version does not include the photos. I give up. What does "philtrum" mean? Philtrum would seem to be a word of limited usage. It will be interesting to see how you set about popularizing it.